Comments: Some of this piece is a woven tape with needlelace fillings – the so-called Mezzo Punto. 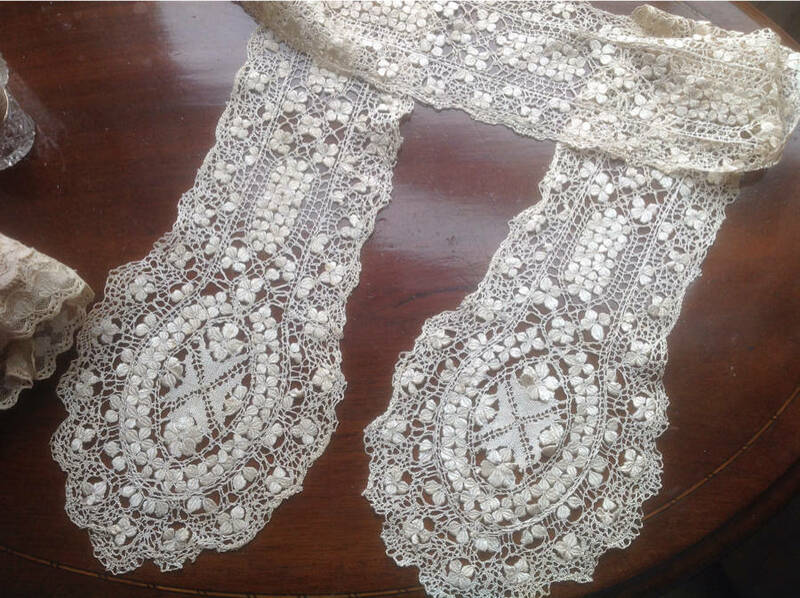 Other parts are all needlelace – and that in itself is unusual – normally it’s Mezzo Punto or needlelace, not a combination. The brides with picoted loops are something you see in English early work, and it looks like some of the fillings are made with knotted stitches, not twisted ones. This is an early English characteristic. Yet I don’t think this is a really early piece, and I’ve been reading a lot lately about late 19th century copies of early needlelace made in England (especially by Treadwin who brags about how she carefully duplicated threads, techniques, and even color). I’m not saying that this is one of her copies, but I do think the technique doesn’t really have the precise old technique. And the piece is suspiciously long and in good condition. Modifications: Both ends cut, interesting bobbin-made engrelure attached. Soilage: It has an older patina and feel, and is generally soiled. Sold for 122.00 GBP, 7 bidders. 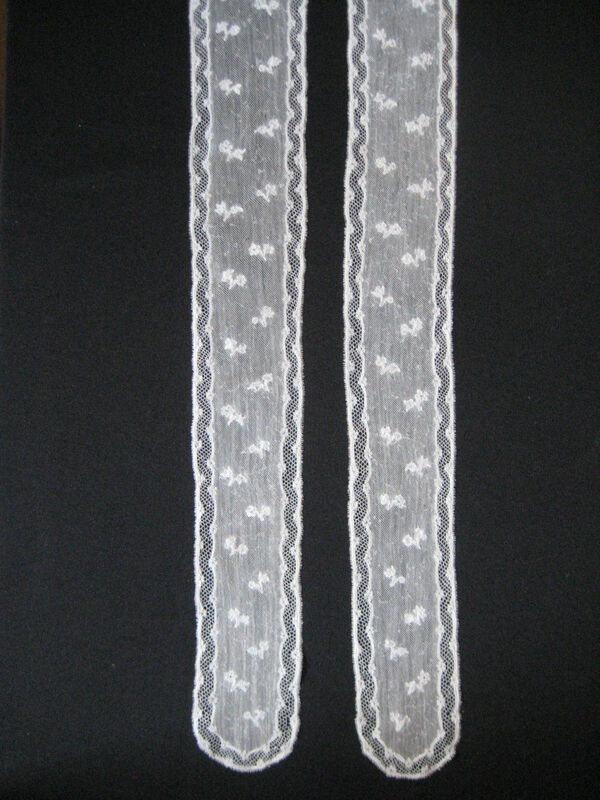 Comments: A Milanese tape lace with typical plaited ground. The design is an undulating tape with flower head terminations incorporating holes in the tape – a little plain for Milanese, but a staple product. I’m thinking it’s a later piece – Milanese developed in the mid 17th c originally copying the designs of Venetian needlelaces. 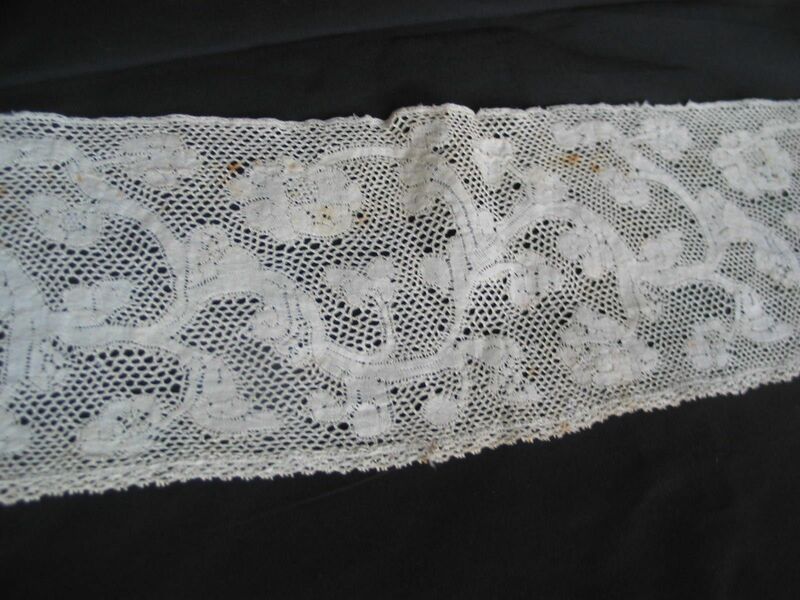 But it was a long-enduring lace, simplifying over the years, and you see photos of women making it even in the early 20th c.
Modifications: Ends and lower border have a needle-made edging added. Probably not original since the ends look cut. Apparently used on a black dress, some threads remain at the top. Soilage: Worn, aged appearance and color. Sold for 62.00 GBP, 2 bidders. Damage: One repair to a filling, looks like they added a little tulle and did some embroidery. Minor. Tulle looks intact. Soilage: Looks clean and sound. Sold for 32.00 GBP, 1 bidder. Comments: A Maltese lappet scarf, typical cross on the bulb ends, and note the little 4-leaved woven motifs used throughout. Some nice dense woven leaf technique. A good example of the type. Soilage: Look clean, tiny bit of wrinkling along edges, minor. Sold for 29.00 GBP, 3 bidders. Comments: A Honiton collar. Design is rather snails/slugs, but nicely done. Turkey tails around the outer border, the inside motifs look rather ‘looped’. Good tally work in the fillings. Soilage: Look clean and quite precise. Size: Seller says “I will measure it when I locate my tape.” LOL. 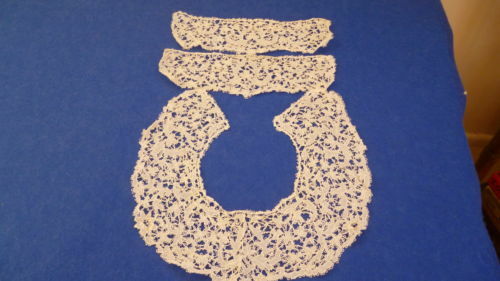 Comments: A Carrickmacross guipure collar with matching cuffs – unusual to find these together. Plenty of the characteristic looped picots, especially on the brides. It’s a rather dense pattern, with there were closer overall photos. Damage: Nothing obvious from the photos, but not enough closeups for an accurate assessment. Soilage: Brown beige color, a few brown spots, a little wrinkled. I bet it would recover nicely with an appropriately conservative wash.
Sold for 18.00 GBP, 2 bidders. 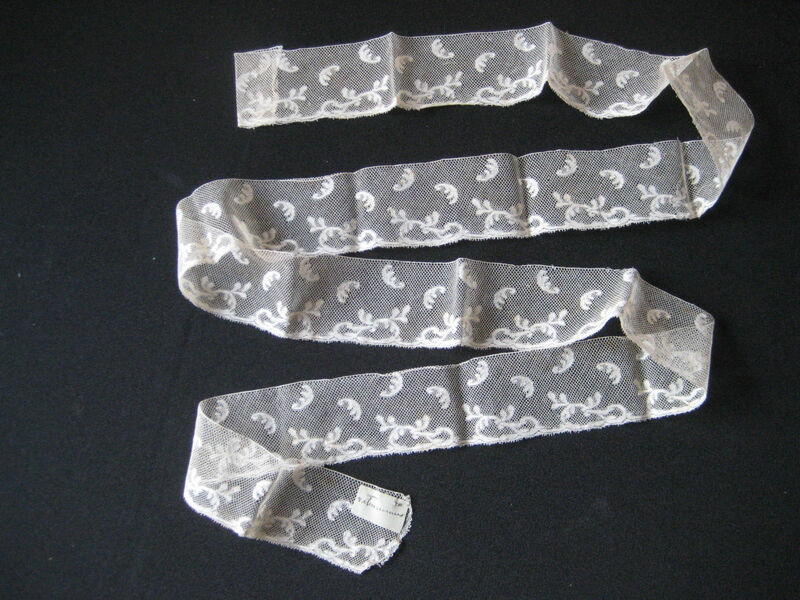 Comments: An Italian tape lace, the form resembles the very fine l’Aquila tape laces. But I think this is a later example, and the design is a lot more open, but still has the l’Aquila symmetry. Looks like some of the plaited fillings and connections were added later, although you’d have to get it under a microscope to tell for certain. No width is given, that might give more information. Modifications: Cut one one end, can’t see the other. 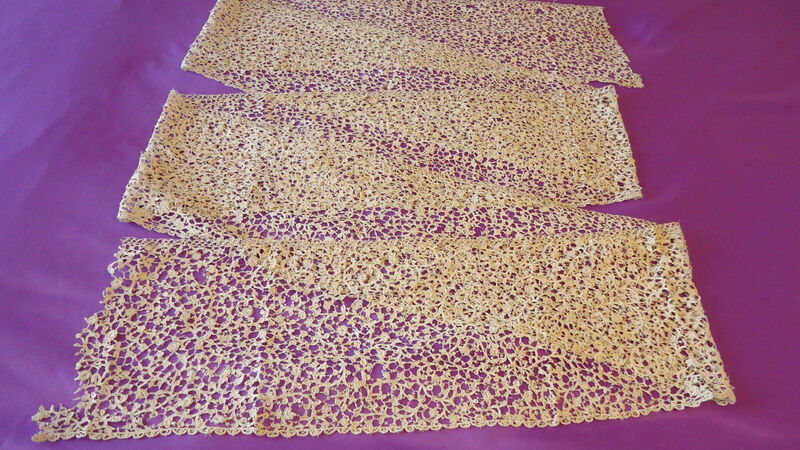 Soilage: Brown beige color, as are all of the pieces this seller has from this collection. They really are consistent, and I wonder if they all got a tea bath at some point. Sold for 122.00 GBP, 4 bidders. Comments: A shawl of Honiton applique on machine net. I think it’s square in shape, and could be used as a veil, or doubled as a shawl. The motifs are fairly large, especially in the corners, and note the elaborate sprigs in the center part. You see this a lot in Honiton applique. Good tally fillings done over fairly large areas. A little snails/slugs, but nicely worked. Damage: A few small localized holes in the tulle. Soilage: Looks clean from the photos. Sold for $195.00, 1 bidder. Comments: A handkerchief of Duchesse de Bruxelles, with unusual ungrounded raised petal Point de Gaze roses. Roses are well integrated in the design. Some raised work in the bobbinlace, good dense design. Soilage: Cream color. It has a slightly wrinkled washed look. Sold for 174.00 GBP, 6 bidders. 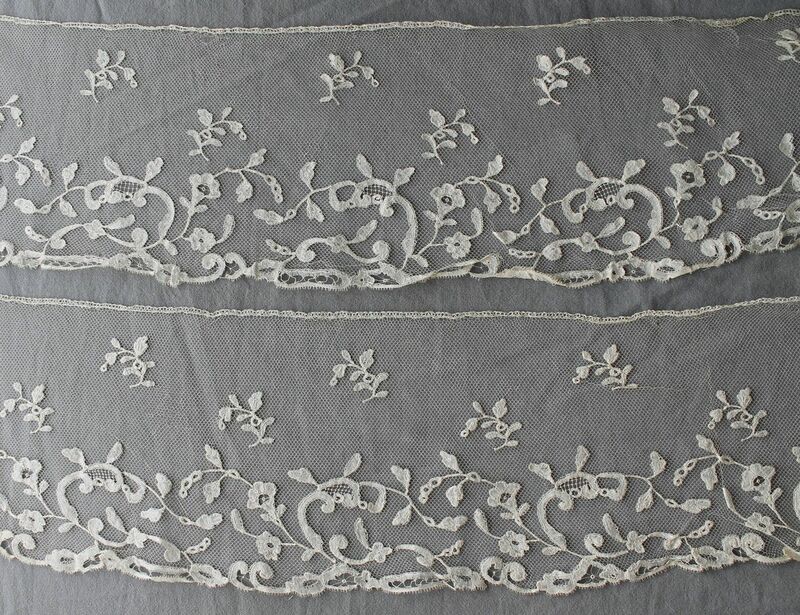 Comments: A pair of Mechlin lappets, very light design typical of the later 18th c. They are a little strange, the pattern of the lower parts is almost matched by the pattern of the upper ends, which has been sewn on. Many more sprigs in the upper part, although they seem to be the same as the ones lower down. The openwork border is also quite unusual. Something I’ve not come across before. Modifications: Sections on the top have been added on. Tops are cut. Damage: Expected pulls in the mesh, fairly minor. Soilage: Look clean from the photos. $45.00, 1 bidder, reserve not met. 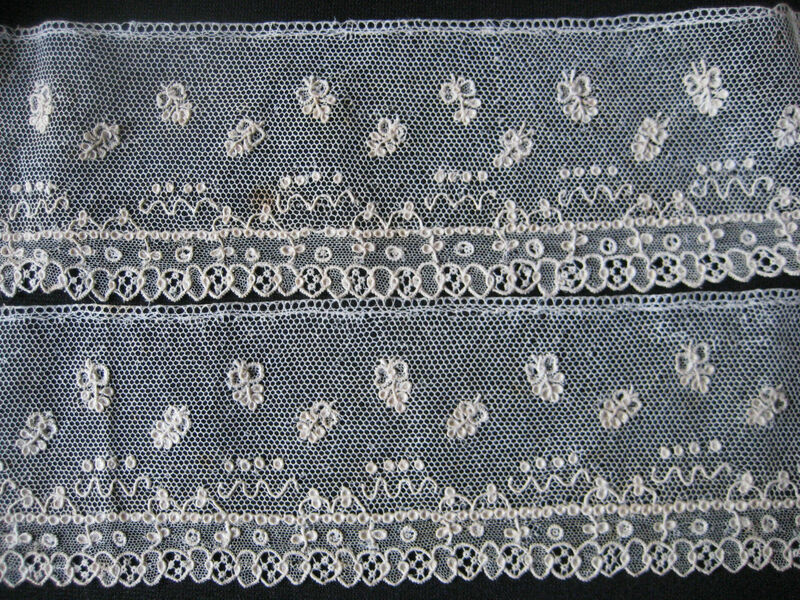 Comments: A pieced bobbinlace flounce with needlelace ground and fillings, Point de Milan type, probably made in Belgium. 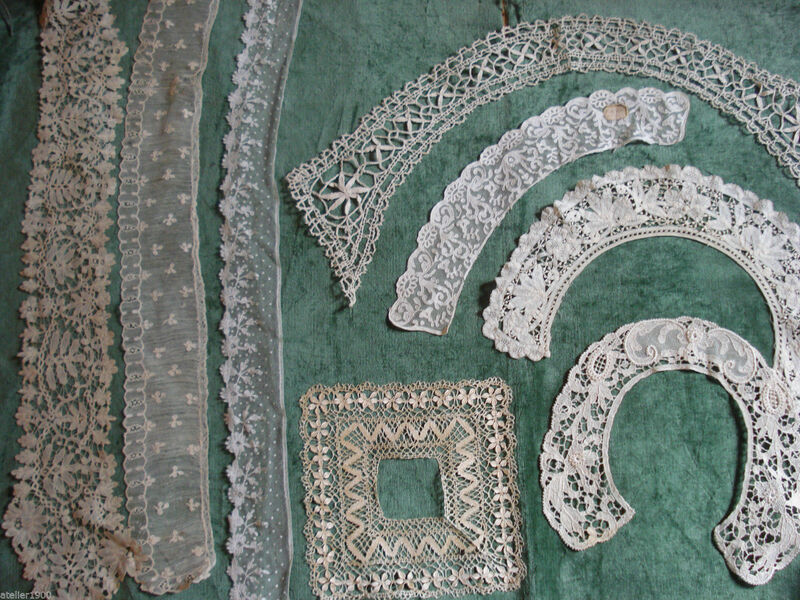 Later 19th or early 20th c. Some raised work in the bobbinlace, and note the three-lobed flower terminations. There’s a lot of looping of the plain tape. 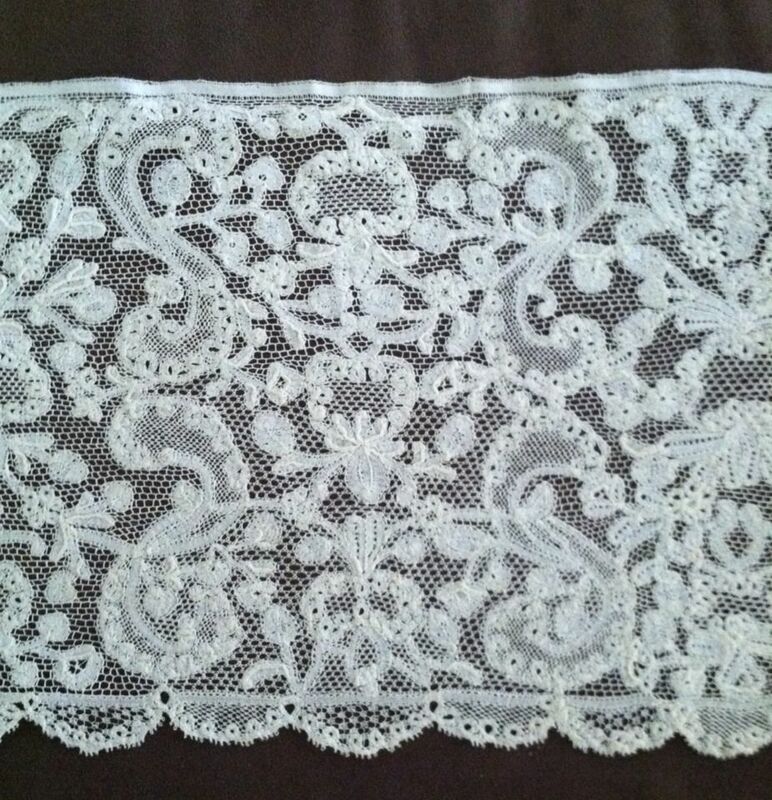 This is a lace much used as edgings for table linens. 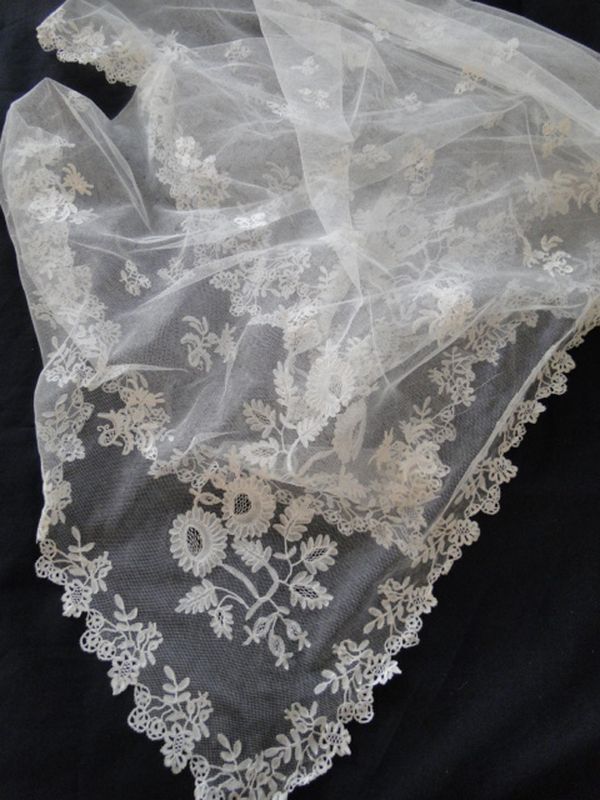 Modifications: Ends nicely terminated, although that’s not difficult with a pieced lace. Damage: Nothing obvious from the photos, but seller cites 1 small fray on an end corner. Soilage: Seller cites creamy color, and 2 soiled areas. Comments: An Alençon border, late 18th early 19th c design. Réseau fin along the lower border, brides tortillée above. Small, well worked motifs throughout, and I find the design a little confusing. Short repeat, meant to be ruffled. Modifications: The one end that I can see looks properly terminated. Seller cites many joins. Engrelure added at top edge. Comments: A square-mesh Valenciennes narrow border. Nicely worked, very tight clothwork. The design is quite precise, it reminds me of the best in ‘line-drawn’ round hole Val. I think this piece isn’t too far away from that tradition. Modifications: Cut both ends, one join. Damage: Some fraying along lower border. Soilage: Small brown spots shown in photos. Comments: An early (~1730) Valenciennes border segment, kind of a rose-5-hole ground with some snowflake fillings. Nice line-drawn design. Wish there were more. Modifications: Ends cut, engrelure added. 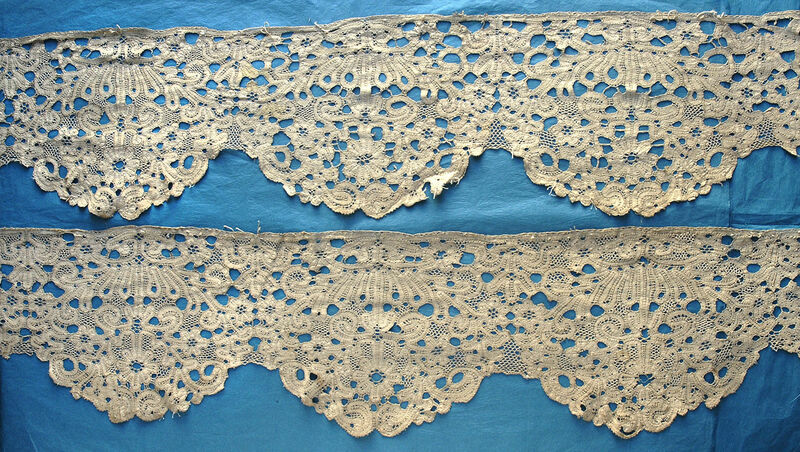 Looks like the picoted border at the bottom was added later, a common 19th century procedure to liven up an older lace. One join. Damage: Some fraying, minor holes. Comments: I’ve been helping this seller with descriptions, and this is an interesting one. Mrs. Treadwin died in 1890 and her shop was continued by Ellen Herbert until 1929. 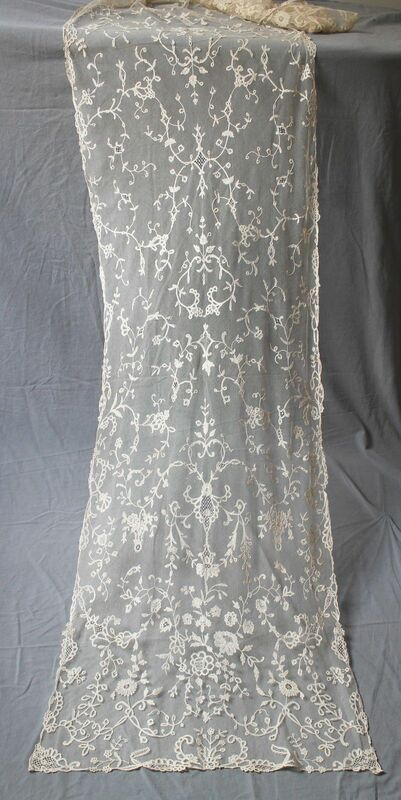 Unclear exactly when the lace was purchased, but it does seem that it was after Mrs. Treadwin’s death. It appears that it was cut from a longer piece in 1927. Treadwin usually marketed local work, however this piece does look to me like a Sluis Duchesse modeled on an older Brabant pattern. 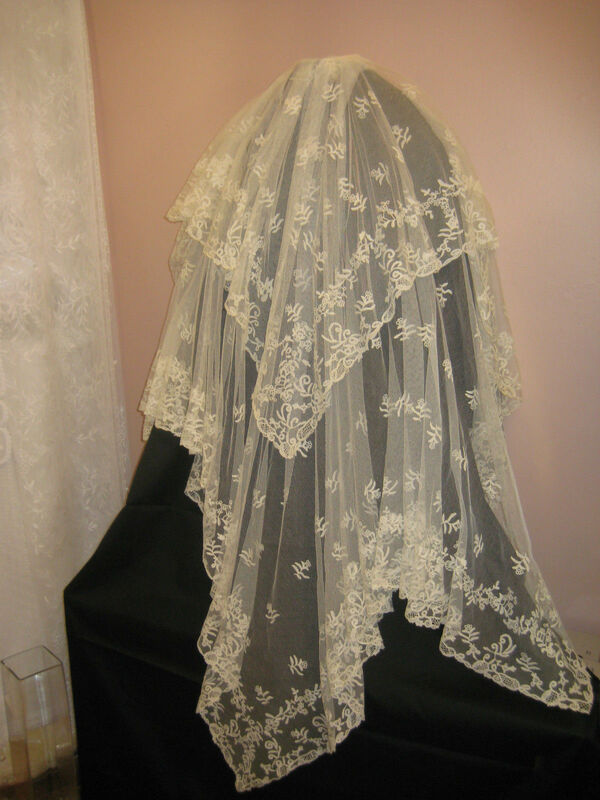 Provenance: From an old New England lace collection. Attached note: Jan. 1927, Honiton (?) 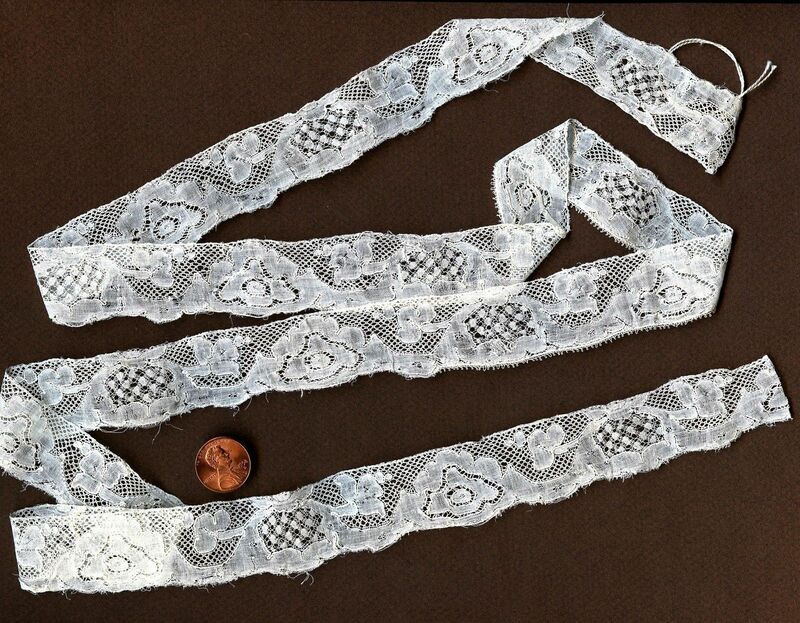 Lace from Lady Mt. Stephen bought at Mrs. Treadwin’s shop in Exeter, Devon. Soilage: Seller cites small age spots, see photos. Comments: A Honiton guipure bertha. Large motifs filled with well-worked tally grid fillings. A little snails/slugs, but breaking out of the mold. Provenance: Ex. coll. 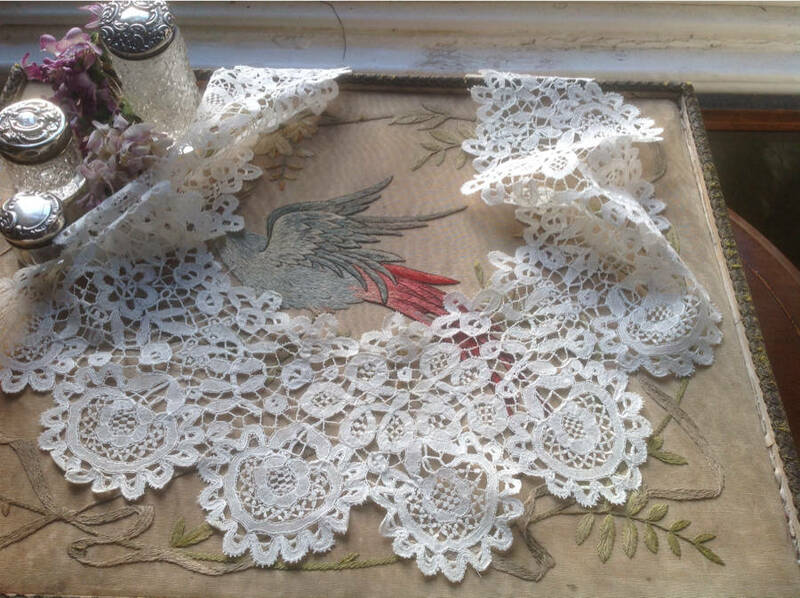 Susan Cox, The English Lace School, Tiverton. Damage: Seller has reattached broken brides. Soilage: Washed by seller. Antique ivory white. 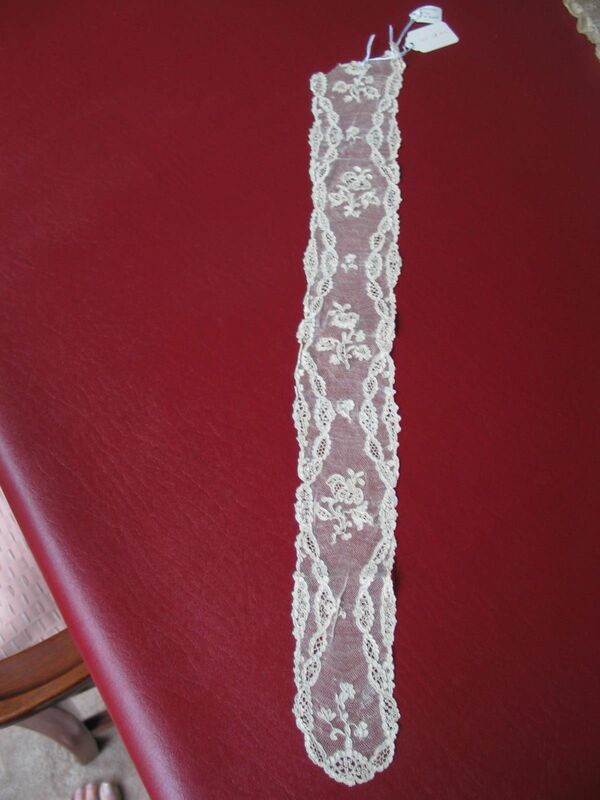 Comments: This seller is offering several borders of Brussels bobbinlace application on machine net. I’ll talk about three of them, but go to the seller’s page to see more. 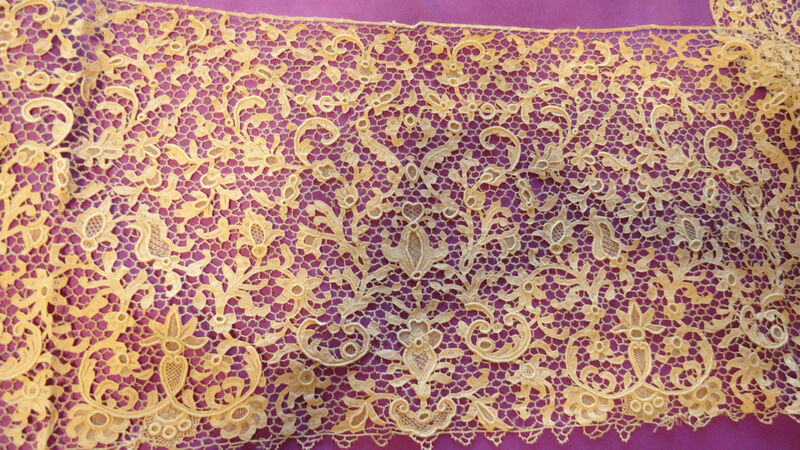 Applications like this were a very popular lace, and I’m surprised we don’t see more in the US. They are a staple product of many French dealers. Quality can vary a lot, and they could be made fairly quickly. 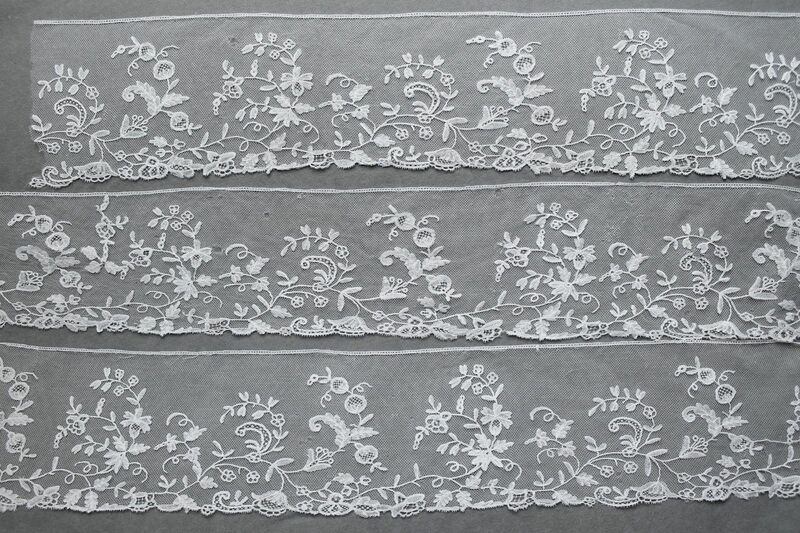 They often have a few needlelace fillings, usually juts simple knots, and are sometimes called ‘Application d’Angleterre’, although I hesitate to use the term since it is not too well defined. Old catalogs usually say something like ‘Application de Bruxelles’. The examples shown here are typical middle-market patterns, light and simple, probably later 19th c.
Modifications: All segments cut at the ends. Damage: A few small holes throughout the pieces. Soilage: Look basically in clean condition. Sold for $83.50, 3 bidders. Sold for $82.00, 5 bidders. Sold for $82.00, 3 bidders. Comments: A rectangular shawl of Brussels bobbinlace application on machine net. Scrolling design, fairly simple, with some needlelace accents, much in the style of the borders discussed above. Soilage: Cream color with some small orange marks. Sold for $420.55, 2 bidders. Size: collar 3″ to 4″ x just under a yard. Cuffs 5″ deep ~10″ around. Comments: We see a lot of Irish Crochet around and there are many types. Early on the art imitated Venetian Gros Point, and occasionally you find a piece more or less true to that origin. I do recognize a few motifs here that resemble the earlier pieces, and the looped picots are quite unusual. So is the rather elaborate raised work on some medallions. Note in particular the picots around the edges of the motifs giving them a little frilly appearance. Modifications: It looks like a set, although I can’t see the backside of the cuffs to tell if these were originally cuffs or adapted from a longer length. The design of the collar isn’t very consistent around the center motif, looks like there’s some alterations in this area. Damage: A few loose trailing threads and broken brides. Seller cites a few old repairs. Soilage: Hard to tell from the photos, but looks like a cream color. Sold for $75.00, 1 bidder. Comments: A Mechlin border, mid 18th c Louis XV design. Mechlin experimented a lot with grounds during this period, and this has the cinq-trou or 5-hole ground. 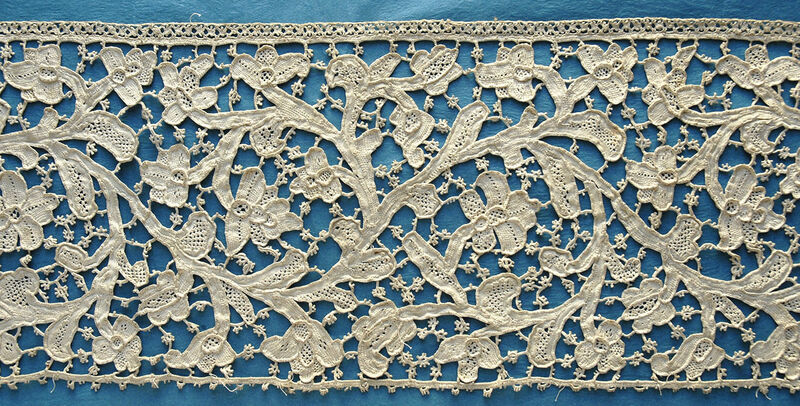 Some snowflake fillings and a little clothwork decoration, but mainly the slightly chunky plain clothwork you often see in this lace. Modifications: Definitely cut one end, can’t see the other end. One section has a later picot edging added. Damage: Extensive fraying especially along the lower edge. Comments: Normally I don’t review collections but there are some interesting pieces in this one. A Burano collar, Honiton and bobbinlace application border, Beds or Cluny collar, Maltese square, a labeled something that’s not close enough to identify, and what really caught my eye, an early Burano border. Modifications: Not much, borders probably cut at ends. Damage: varies from piece to piece, but good on average. Sold for $65.00, 1 bidder. 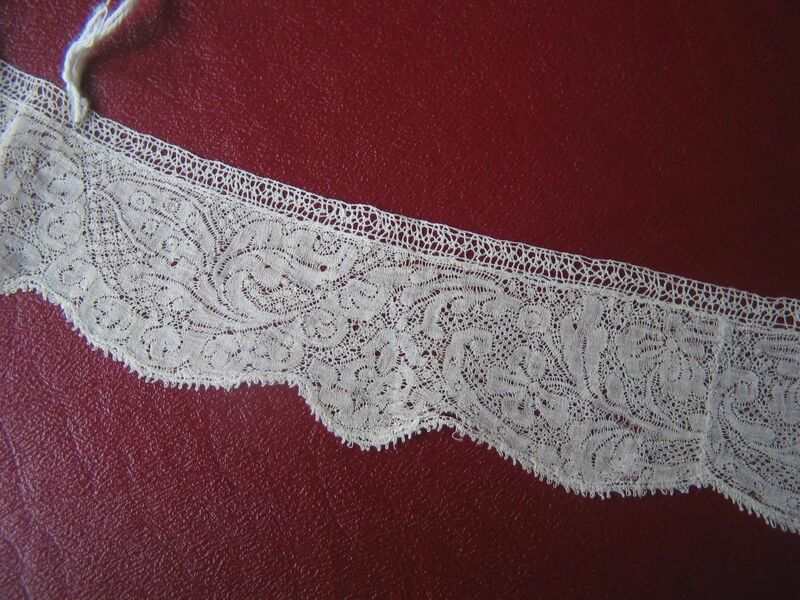 Comments: This is a lace we call ‘Punto Tirato Tela Sfilata’, which is the name given in very early pattern books. Basically a drawnwork with remaining threads whipped around to secure. They were usually made as part of a larger linen, and this has been cut away from the original base. the work is quite precise. Date is always difficult on things like this, known pattern books go back into the 16th century, but it was extensively made for several hundred years. 17th c is a possibility. Modifications: One end looks cut and secured, can’t see the other end. Seller cites two joins but I can’t find them in the photos. Cut away from linen top and bottom. Damage: A few small holes throughout. Soilage: Seller cites several brown marks. Sold for 34.00 GBP, 2 bidders. Comments: This is a continuous bobbinlace of the type made in central Italy usually around Pescocostanzo. 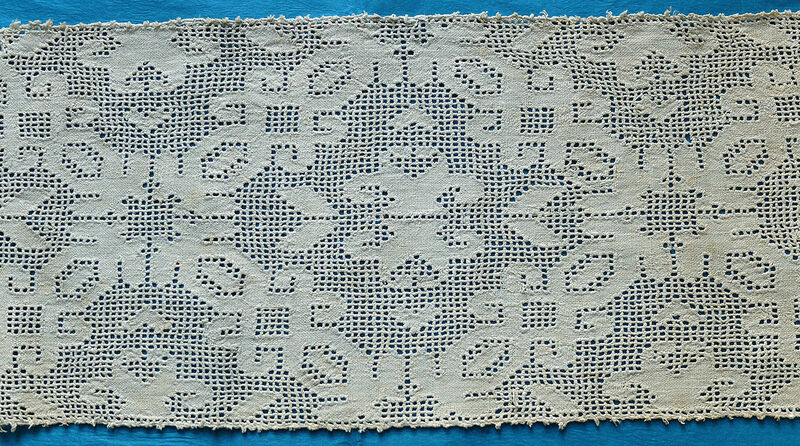 4 thread plaited ground with rather blocky motifs, extensive plain clothwork, good bold design. 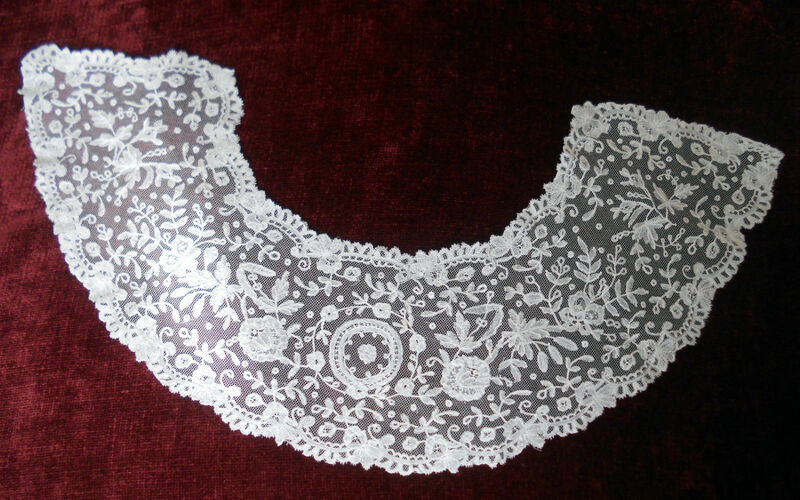 Despite some recent books on the subject it remains a poorly documented lace. 18-19th c, hard to tell. Modifications: Can’t see ends to tell if they are cut. Damage: Upper edge cut away in selected regions. Soilage: Some brown spotting throughout. Comments: This does look like an early Italian piece, although I’d hesitate to call it Punto Neve. 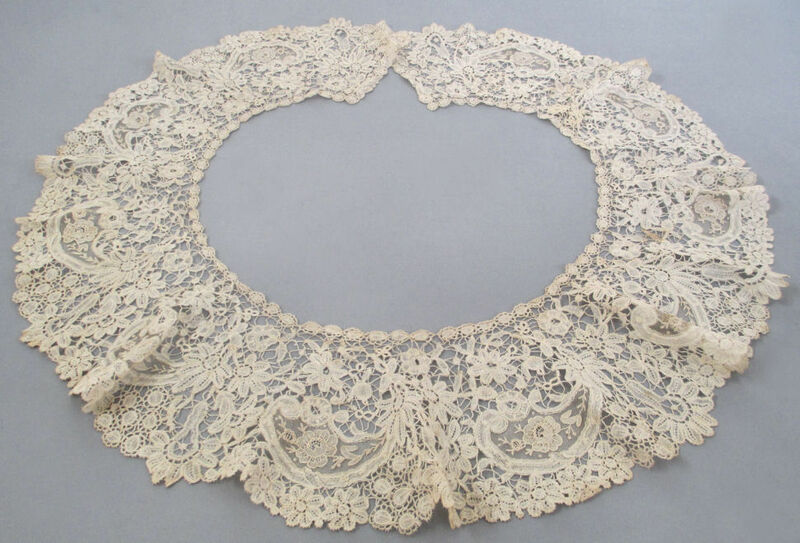 The true ‘snow lace’ is much more elaborate than this. But it’s getting there. Good decorated brides and some nice raised work. It does have the meandering design that is more typical of Italian than of French work. Modifications: Cut on both ends, bobbin-made engrelure at top. Hard to tell if there was any reassembly. Damage: Broken brides, some small repairs throughout. Comments: I’ve been discussing this piece with the seller and looking at some additional closeup photos, which is why it got added late to the Alerts. 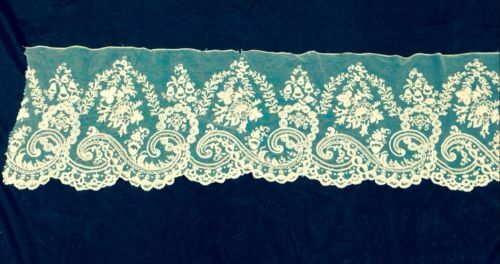 My take is that it is a late 19th or early 20th century Belgian needlelace, in the style of Point de France. A couple things catch my eye. 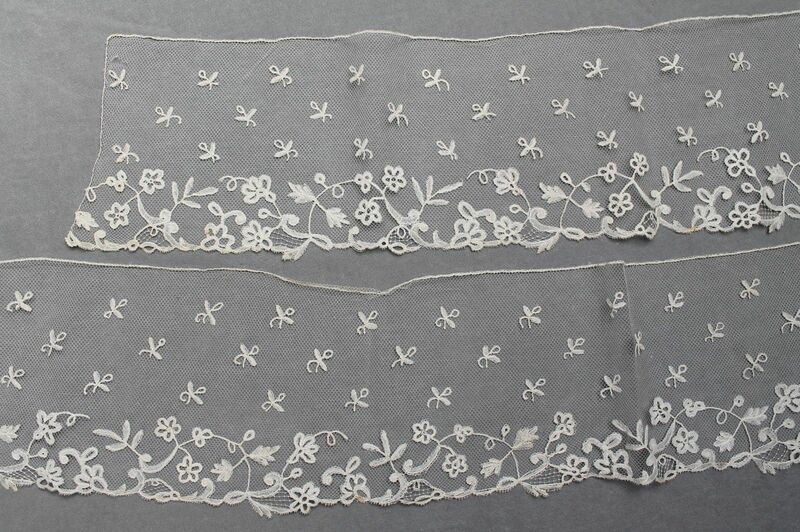 The needlelace clothwork is a little coarse and doesn’t follow the outlines of the motifs well in many places. The motifs always have a buttonholed cordonnet, which is not typical of early Point de France. This cordonnet is buttonholed with spaced stitches, a Belgian technique often seen in Point de Gaze. The brides are a little strange, they are knotted loops of thread, and this does not seem to have been a wise technical choice. The single thread loop is easily damaged, and it looks like the piece is cotton which doesn’t help matters any. Many of the brides look frayed. In an early piece all the picots would be buttonholed. Also, some of the padded outlines are well shaped, others are kind of chopped off at the ends. Overall the piece has a bit of a heavy look. It’s definitely an interesting piece. Modifications: Cut on both ends. Damage: A few loose brides, along with fraying on the brides because of the technique, see comments. Size: 5.75″ deep, ~40″ ‘across the top’, which might be the outer circumference. Not sure. Comments: A Brussels Duchesse bertha, no raised petals on the Point de Gaze roses. 10 repeats around the circumference, typical Duchesse motifs with a little raised work. Damage: Nothing obvious from the photos. Pt d G mesh looks intact, which is nice. Sold for $107.50, 5 bidders. Comments: An Alençon lappet, probably 3rd quarter 18th c. Wish the other one was there, these usually don’t survive well because of the very fine rèseau. Good fillings although on a small scale, and the design changes along the length, sign of a better piece. Modifications: Irregular cut at the top. Damage: Extensive repairs to the mesh, shows it was a valued piece. Soilage: Seller cites some storage creases. 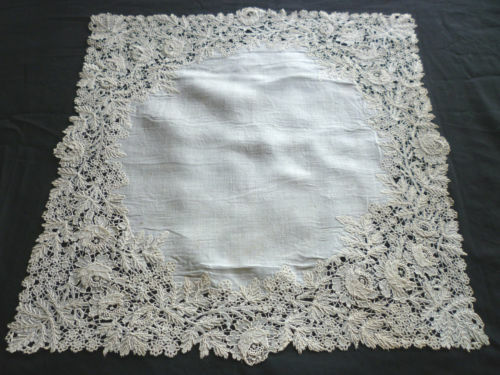 Comments: A square shawl or veil of Honiton applique on machine net. Not many photos, but I don’t see the usual mass of flowers in the corner. Just a double border and sprigs throughout the middle ground. Design is a little out of the snails/slugs style, but not too far. Motifs nicely worked. Unsold as of 3/8/2014 8:06 AM MST. 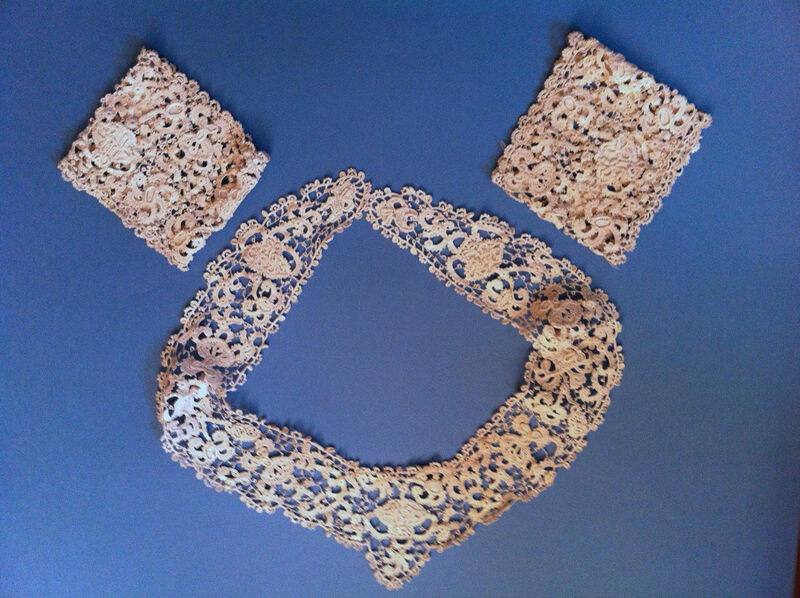 Comments: A fairly wide flounce of Brussels bobbinlace application on machine net, simple needlelace fillings. Good swirling romantic design with a fairly short repeat. No esprits in the upper ground. I think there might be some Point de Gaze mesh used around the roses. Damage: Scattered small holes throughout, two short repairs to net at the top. Some pinholes in the net, and occasional small repair. Soilage: ‘Pale antique white color’.